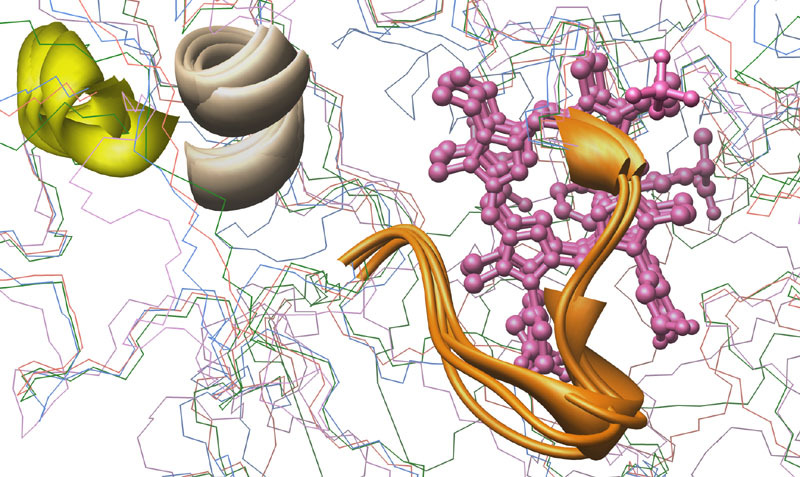 This Protein Image Gallery was assembled using the RCSB's Molecular Model Database, UCSF's Chimera, 3D Jigsaw, AL2TS, CPH Models, and Adobe Photoshop. The source PDB files that lead to the construction of these images are all freely available at the RCSB. RCSB ID codes are listed whenever available in . Click on a link above to jump to a section of interest, or scroll down the page. Consensus of protein structures is done by combining a protein sequence alignment with ClustalX 1.83 for Windows 32 environment with Chimera's MatchMaker functionality. 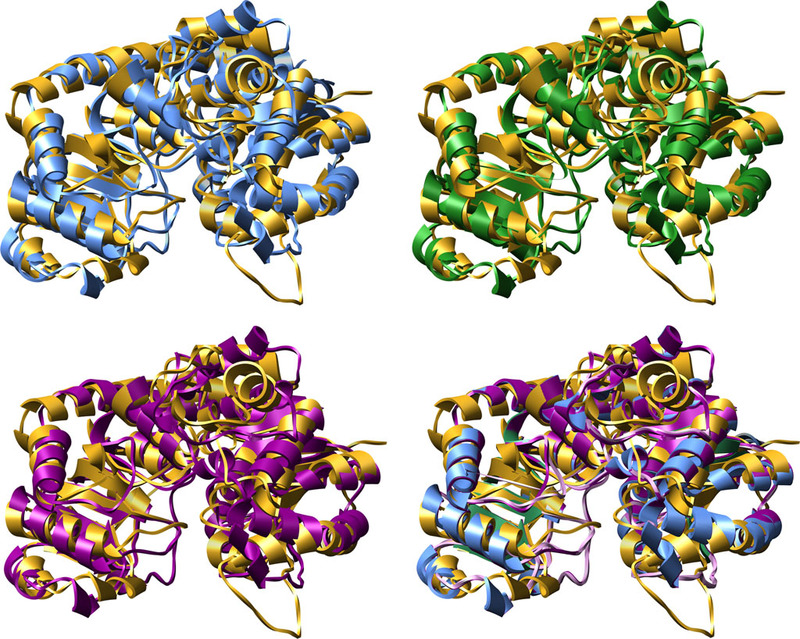 Consensus Matching of 4 Cytochrome P450s as ribbon-structures. P450s and Colors: CYP3A4 [1TQN, Homo sapiens], purple; CYP2B4 [1PO5, Oryctolagus cuniculus], blue; CYP2C5 [1DT6, Oryctolagus cuniculus], rose; CYP2C9 [1R9O, Homo sapiens], green. 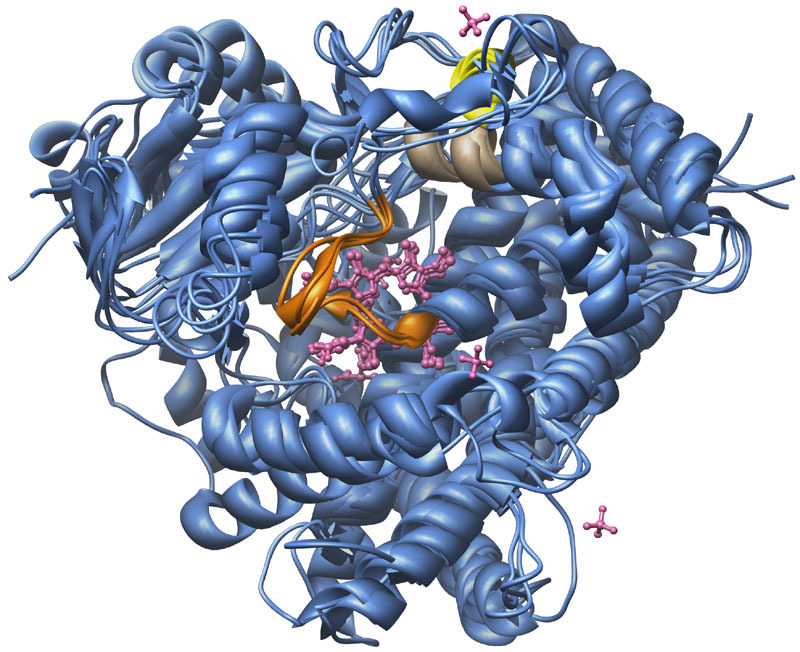 Consensus Matching of 4 Cytochrome P450s as ribbon-structures with bound ligands. P450s: CYP3A4 [1TQN, Homo sapiens], CYP2B4 [1PO5, Oryctolagus cuniculus], CYP2C5 [1DT6, Oryctolagus cuniculus], and CYP2C9 [1R9O, Homo sapiens]. 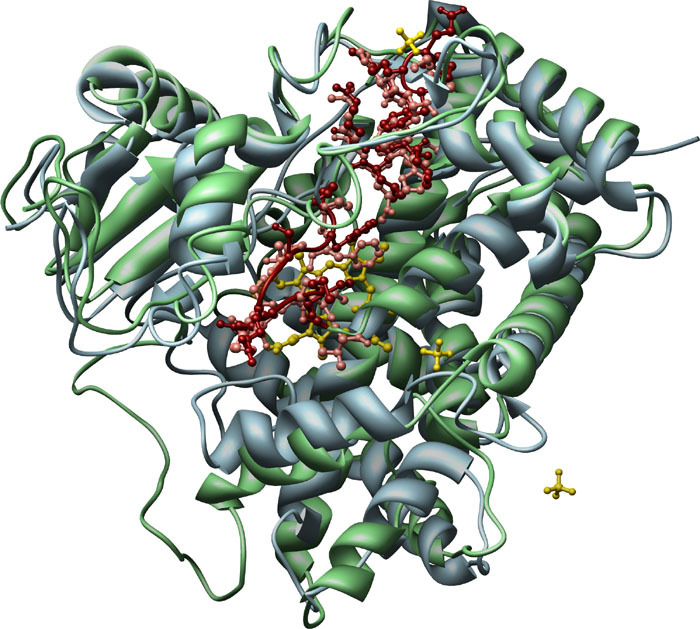 Color key: P450 backbone structures, blue; K-helix consensus, brown; PERF consensus, yellow; heme-binding domain, orange; bound ligands ( heme [all], flubiprofen [CYP2C9], glycerol [CYP2C9], Samarium ion [CYP2C5], Sulfate ion [CYP2C5]), pink. Backbone line structure, ribbon consensus sequences, and bound ligands, in 3 views: View #1, View #2, View #3. P450 color key: CYP3A4 [1TQN, Homo sapiens], purple; CYP2B4 [1PO5, Oryctolagus cuniculus], blue; CYP2C5 [1DT6, Oryctolagus cuniculus], rose; CYP2C9 [1R9O, Homo sapiens], green. Feature color key: K-helix consensus, brown; PERF consensus, yellow; heme-binding domain, orange; bound ligands bound ligands (heme [all], flubiprofen [CYP2C9], glycerol [CYP2C9], Samarium ion [CYP2C5], Sulfate ion [CYP2C5]), pink. CYP3A4 [1TQN, Homo sapiens] ribbon detail. 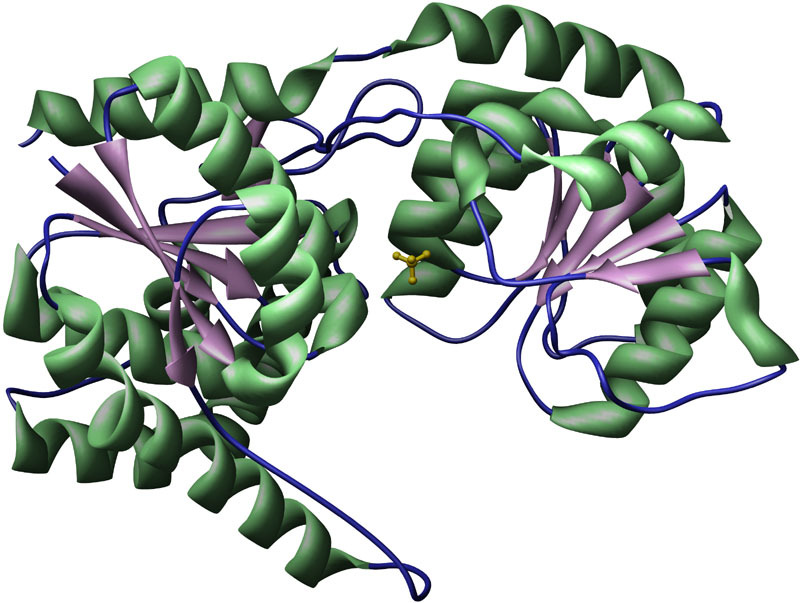 Color key: helix structures, gray; strand structures, blue; PERF consensus, green; K-helix concensus, purple; heme-binding consensus, orange; heme ligand, yellow. Consensus matching of CYP83B1 [Arabidopsis thaliana] as predicted by CPHmodels 2.0 to CYP2C5 [1DT6, Oryctolagus cuniculus], displayed in ribbon and ball-and-stick detail with bound ligands. 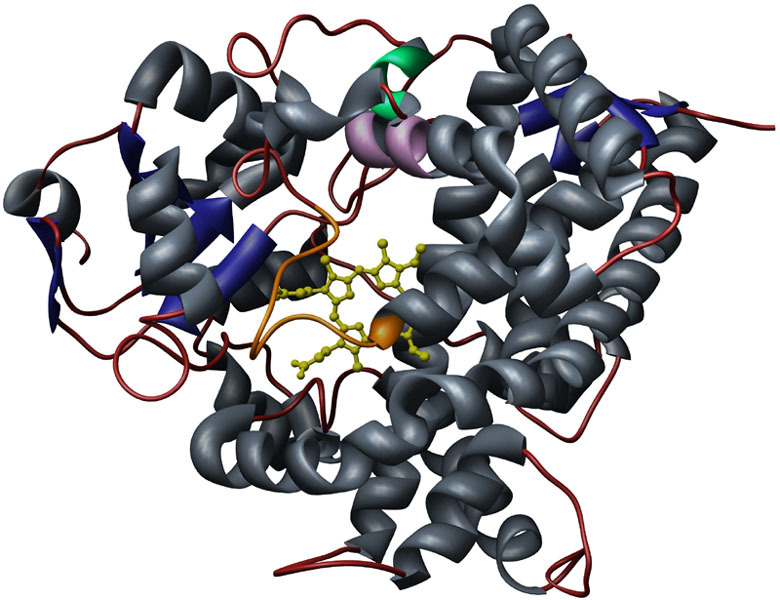 Feature color key: CYP83B1, green; CYP83B1 PXRX, K-helix, and heme-binding regions, red; CYP2C5, blue; CYP2C5 PXRX, K-helix, and heme-binding regions, pink; bound ligands (heme, Samarium ion, Sulfate ion [all bound to CYP2C5]), yellow. 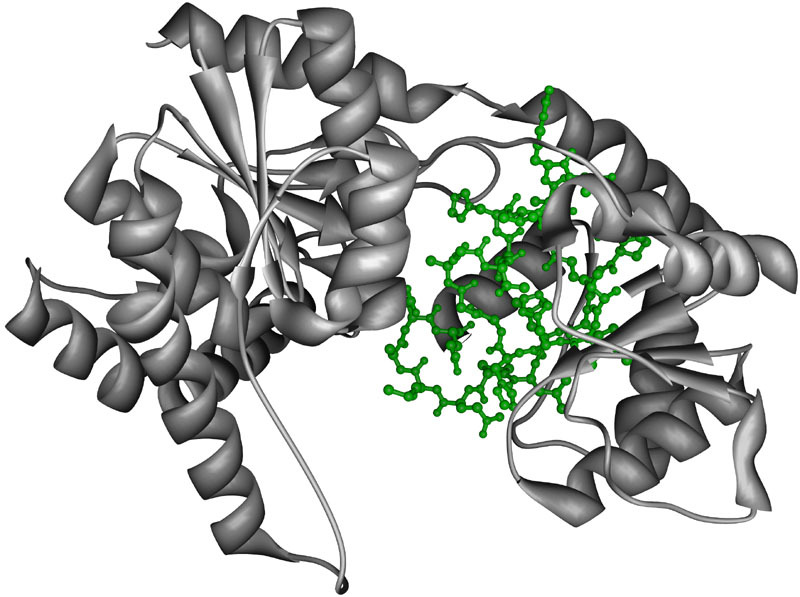 UDP-Glucosyltransferase Gtfb [1IIR] from Amycolatopsis orientalis, ribbon-structure with ligand. 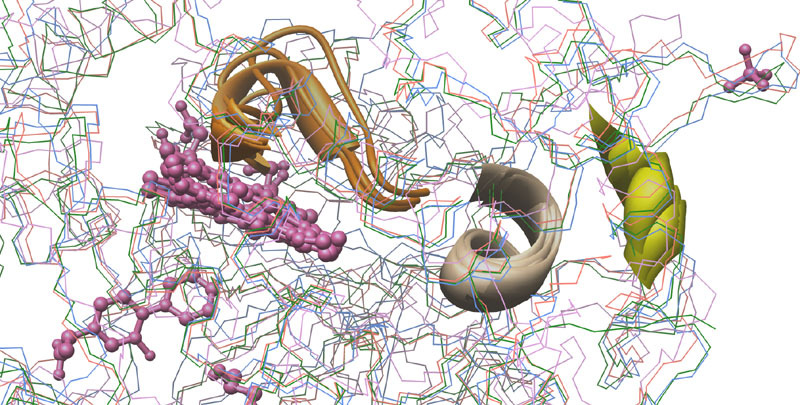 Color key: helix structures, green; strand structures, purple; bound ligands (Sulfate ion, Magnesium ion), yellow. 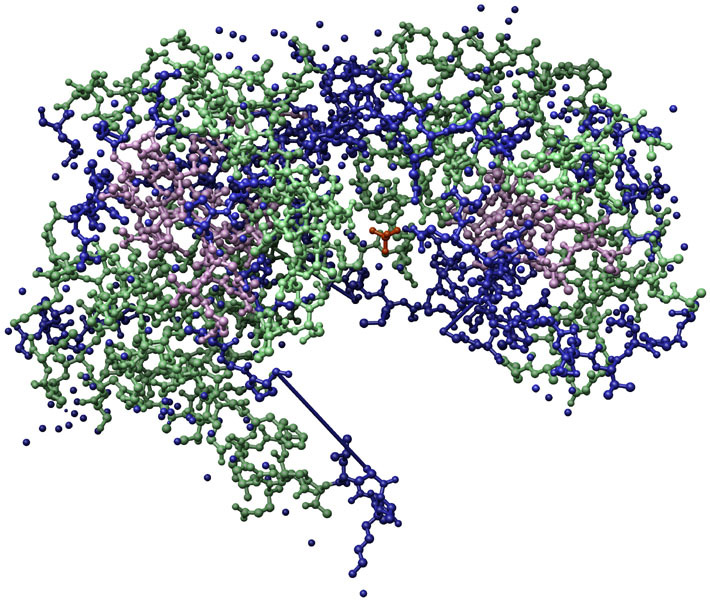 UDP-Glucosyltransferase Gtfb [1IIR] from Amycolatopsis orientalis, ball-and-stick structure with ligand. 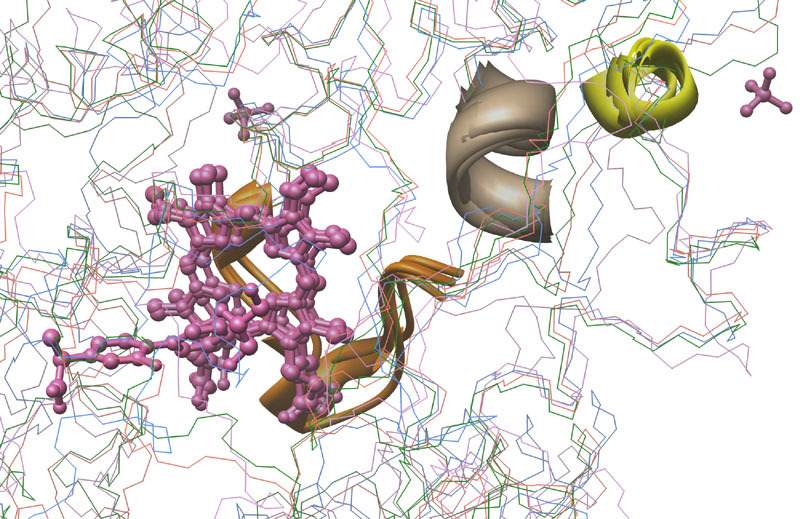 Color key: helix structures, green; strand structures, purple; bound ligands (Sulfate ion, Magnesium ion), red. 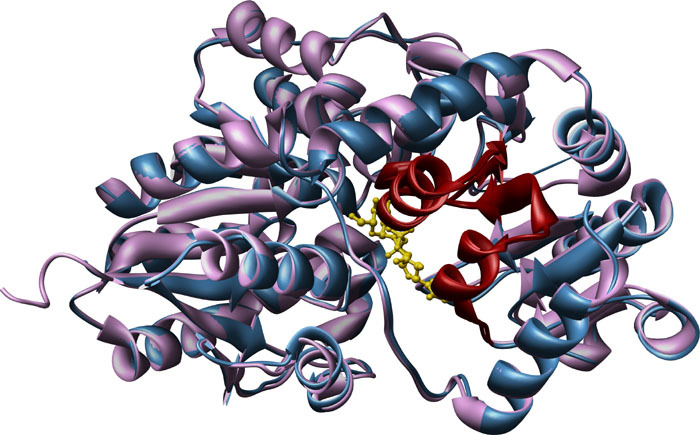 UDP-Glucosyltransferase Gtfb [1IIR] from Amycolatopsis orientalis, ribbon and ball-and-stick structure with PROSITE consensus sequence. Color key: main structure, grey; PROSITE consensus, green ball-and-stick. UDP-Glucosyltransferase UGT85A4 from Arabidopsis thaliana as predicted by 3D Jigsaw and AL2TS, consensus matching. 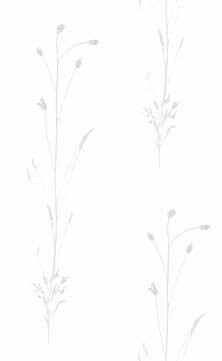 UGT71G1 [2ACV, Medicago truncatula] was used as the template for both predictions. Note the similarities and differences in the predicted structures. Color key: 3D Jigsaw prediction, blue; AL2TS prediction, purple. Consensus matching of UDP-Glucosyltransferase UGT85A4 from Arabidopsis thaliana predicted structure by AL2TS and UGT71G1 [2ACV] from Medicago truncatula. 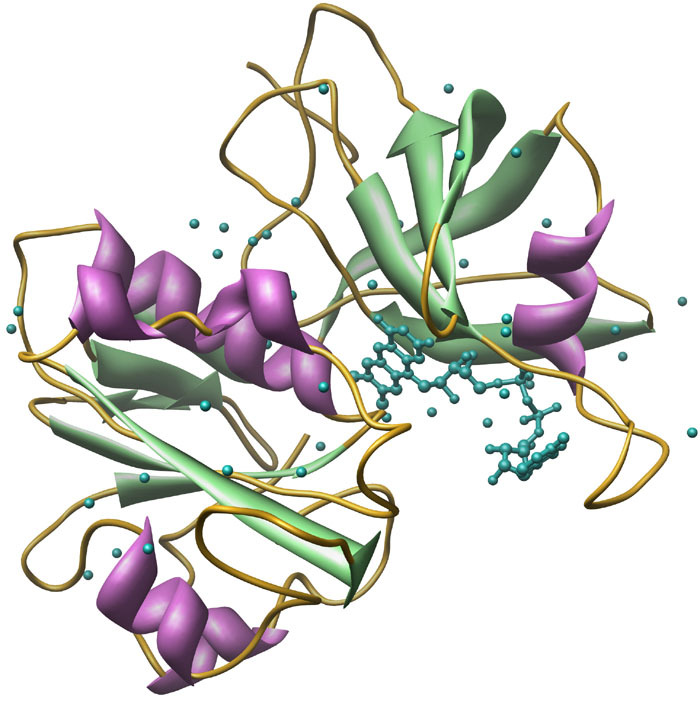 Ribbon detail with UPD-glucose bound to UGT71G1 and plant-UGT motif. Color key: UGT85A4, main structure, blue; UGT71G1, main structure, purple;UDP-glucose, yellow; PROSITE consensus, both UGTs, red. Consensus matching of UDP-Glucosyltransferases UGT85A4 from Arabidopsis thaliana (predicted structure by AL2TS), UGT72B5 from Lotus japonicus (predicted structure by AL2TS), and UGT71G1 [2ACV] from Medicago truncatula against a UDP-glucose:flavonoid 3-O-glucosyltransferase [2C1X] from Vitis vinifera as edged ribbon structures. Color key: UGT from grapewine, yellow; UGT85A4, green; UGT71G1, blue; UGT72B5, purple. 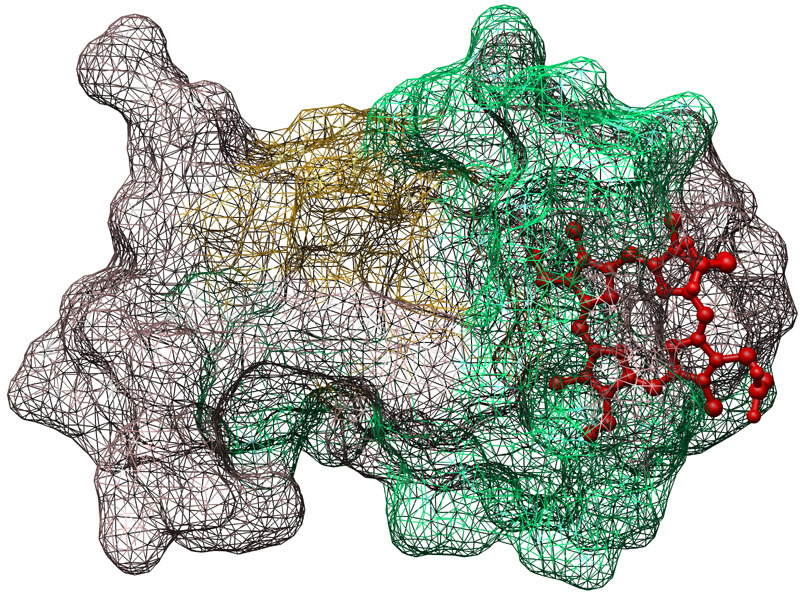 Grapewine UDP-glucose:flavonoid 3-O-glucosyltransferase [2C1X, Vitis vinifera], wireframe detailf. Color key: helix, blue; strand, pink; backbone, beige; PROSITE consensus, dark purple. 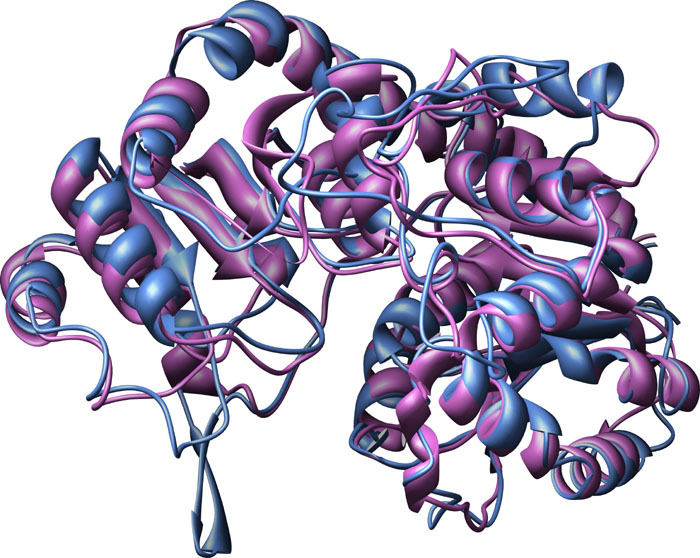 Cyanogenic Betaglucosidase [1CBG] from Trifolium repens, ribbon-structure with water. Color key: helix structures, purple; strand structures, red; backbone, green; water, light purple. Consensus matching of Cyanogenic Betaglucosidase [1CBG] from Trifolium repens and Dhurrinase 1 [1V02] from Sorghum bicolor, ribbon structures. Color key: Dhurrinase 1 [1V02], blue; White clover Cynogenic BGD, purple. 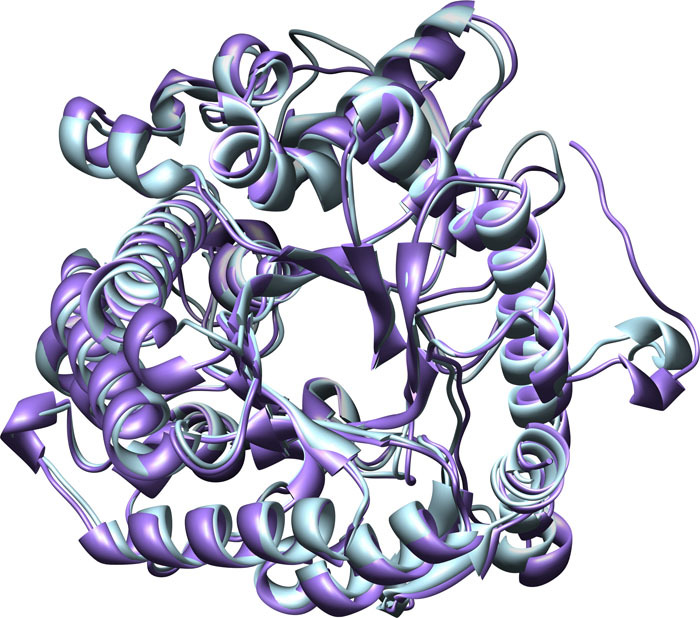 Putative Betaglucosidase from Oryza sativa, structure predicted by AL2TS, solid surface structure. Color key: helix, grey; strand, purple; backbone, green. 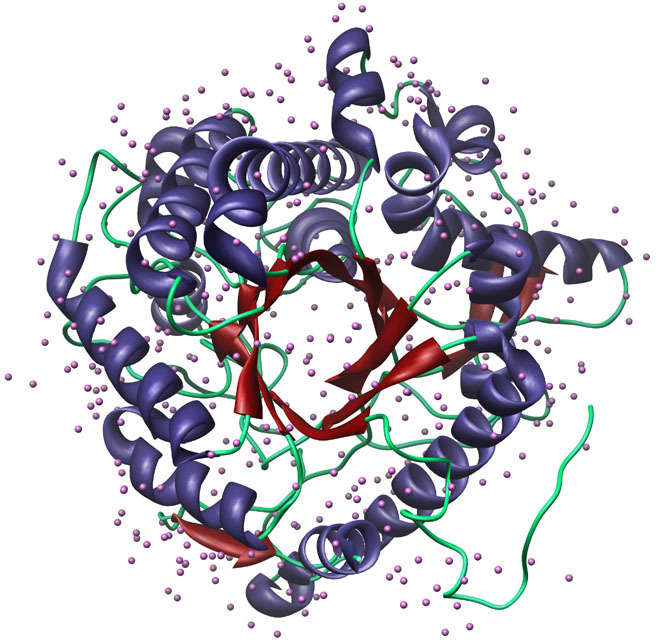 NADPH Cytochrome P450 Reductase [1AMO, Rattus norvegicus], ribbon structure with ball-and-stick ligand. 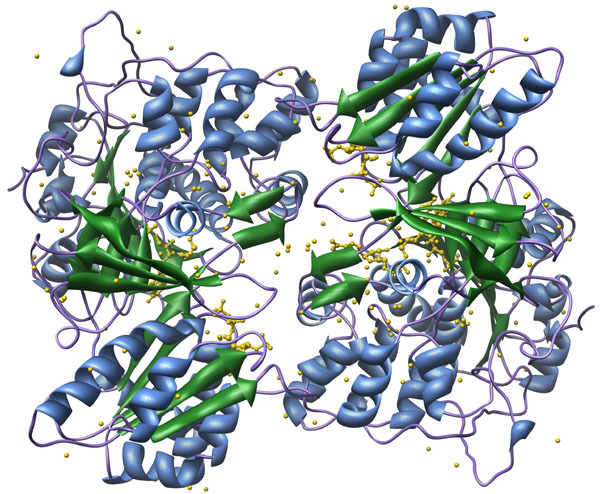 Color key: helix, blue; strand, green; bound ligands (FAD, FMN, NAP), yellow. 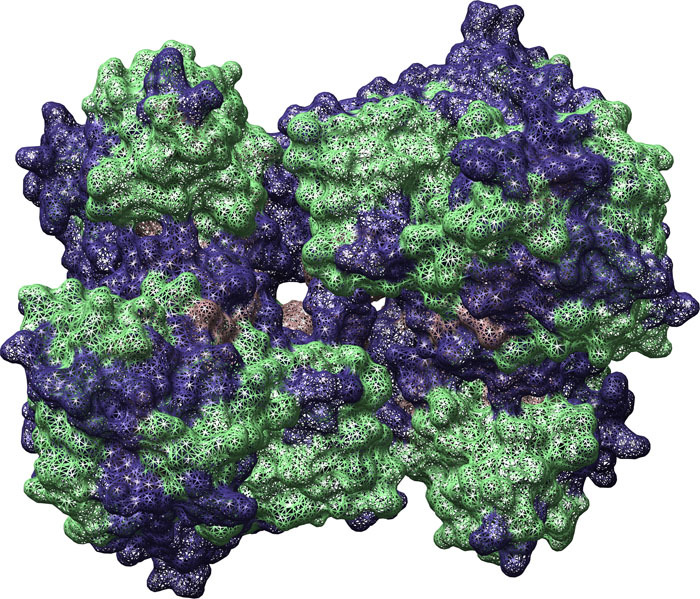 NADPH Cytochrome P450 Reductase [1AMO, Rattus norvegicus], mesh surface structure. Color key: helix, green; strand, pink; backbone, dark grey. 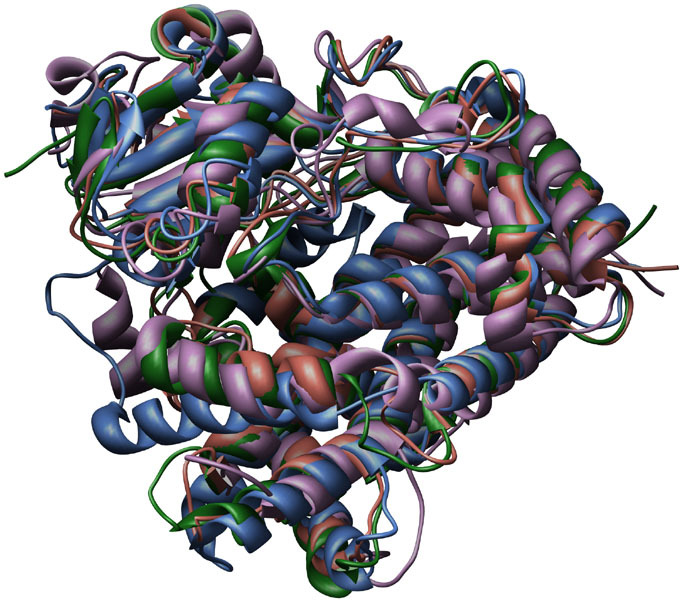 Cytochrome b5 [1B5B, Rattus norvegicus] ribbon structure. Color key: helix, blue; strand, gold. 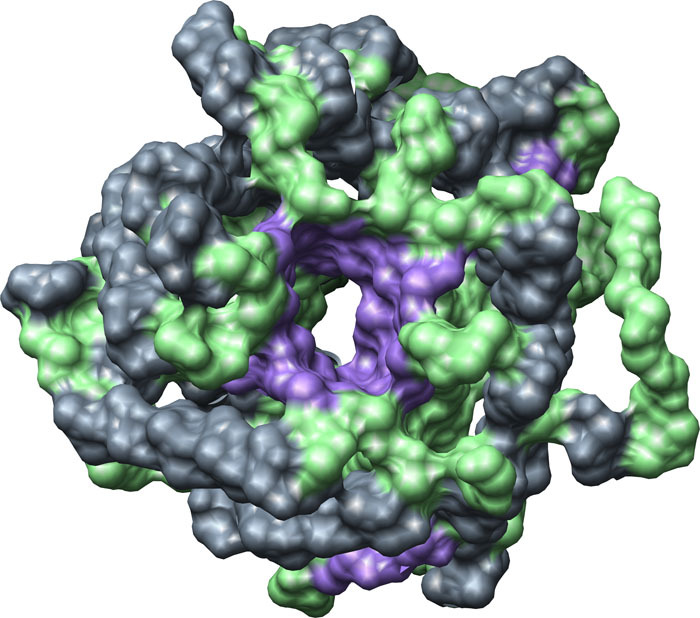 Cytochrome b5 [1B5M, Rattus norvegicus] mesh surface structure with ball-and-stick ligand. Color key: helix, green; strand, gold; bound ligand (heme), red. 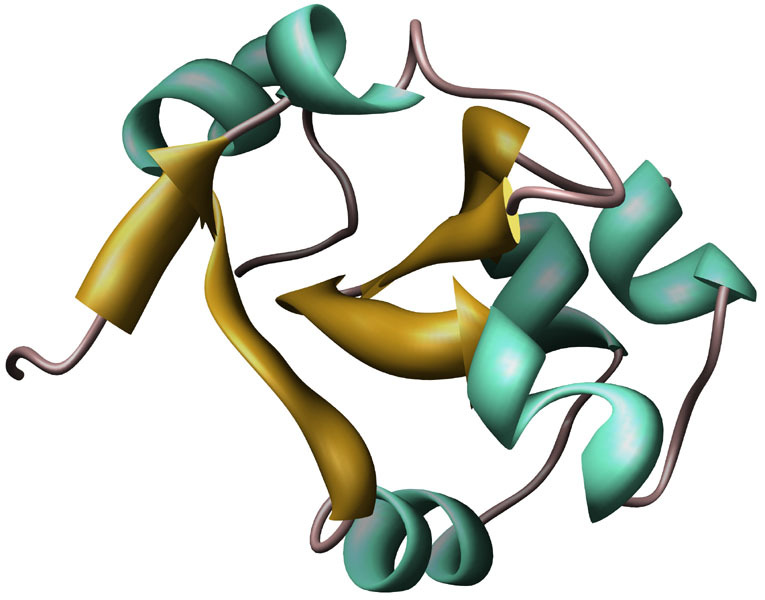 Cytochrome b5 reductase [1NDH, Sus scrofa] ribbon structure. 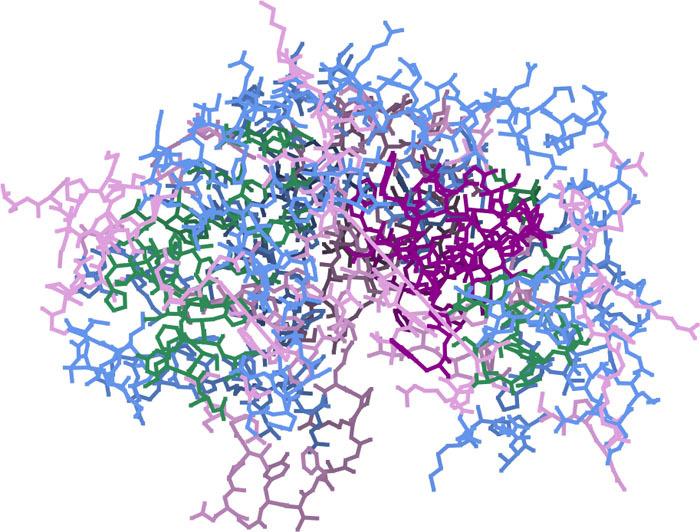 Color key: helpix, purple; strand, green; bound ligand (FAD), blue.